Home > News > Tree Sale > Fruit Trees and Bushes on Sale! 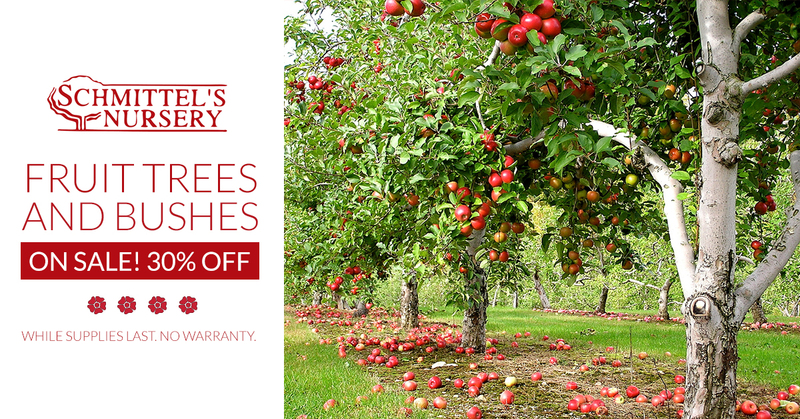 Now at Schmittel’s Nursery, we are currently offering 30% off of our Fruit Trees and Bushes*! This is a while-supplies-last offer to sell out our remaining inventory for the season. Come on out to our nursery to browse our inventory yourself and take advantage of this seansonal offer. We are located in Maryland Heights, just 2 miles north of the Page Extension on Maryland Heights Expressway (or 141). *Note: All sales are final and do not have a warranty.